.my Innovation Award 2010 – more than RM100,000 worth of prizes to be WON! Can’t get enough on innovations? Your creative juice just keeps on flowing out of control? If yes, here’s the good news. 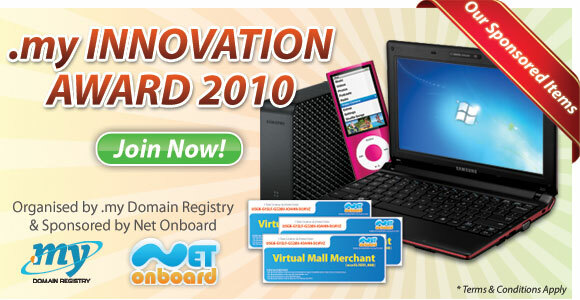 Net Onboard Sdn Bhd is the main sponsor for .my Innovation Award 2010 organized by .My Domain Registry and supported by Mosti. The award is looking for a new innovative website to be crown as the Grand Prize Winner and bring home a Samsung Netbook (worth RM1,299, 1 year Virtual Mall Merchants License (worth RM1,888) & 6 Months Virtual Dedicated Server Basic Plan Subscription (worth RM1,500) and lots more prizes to be announced later. I want to Win! How do I Participate? 1. Click HERE to register first. 2. After registered, login with your user name and password. 3. Submit your website URL and fill in the participation form. 4. Come back to check the prizes from time to time. 5. Winners will be listed in website and informed via email. For more details, please visit .my Innovation Award 2010 official website at www.innovationaward.my. Announcement, Event, Sponsorship contest, innovation, prize August 2, 2010 by admin. We believed that everyone could make a different by playing their part in the society. As one of the leading Hosting Provider in Malaysia, Net Onboard Sdn Bhd with the spirit of togetherness and care proudly launch our latest program – charity Hosting Sponsorship as part of our social responsibility to the community. We would like to invite all charity organizations out there to grab this opportunity for free. May it be an old folk home, orphanage, human or nature related charity organization, you are all most welcome to be part of our program as we want to give our best to help up those who are in the need. FREE? Yes, it’s an ongoing free hosting sponsorship program for Charity board. We will sponsor hosting service to, not 100, not 1000 but unlimited number of charity bodies, which each worth RM250/year. Why limit for charity? That is our belief. You will only need to register, renew or transfer your domain name with us at as low as RM50/year*. - Applicants may download the Application Form here, fill up the details, print the form with their organization letterhead, and to be authorised by the Chairman. - The completed form will then to be faxed to us or submitted via www.supportchain.com together with organization registration document. - Applicants will need to have a “Hosted by Net Onboard” link at their website, which links back to Net Onboard website. 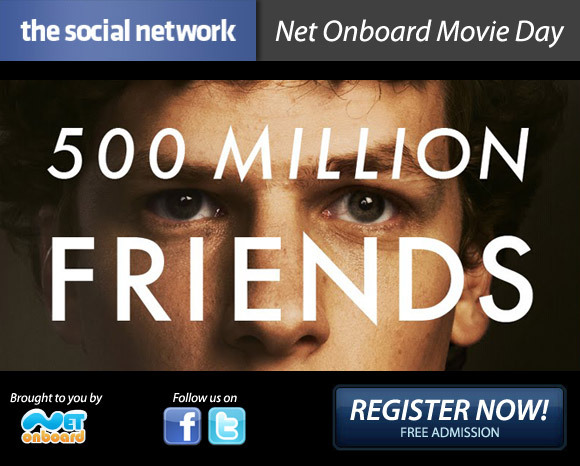 - Applicants will need to have Net Onboard banners on their websites, which links back to Net Onboard website. - Applicants shall not place any kind of advertisment with regards to webhosting promotions at their web. - Applicants need to fill up the Application form and approval of sponsorhip is solely determined by Management of Net Onboard. - This sponsorship program does not include Domain Name as its sponsorship item. Applicants will need to pay for the Domain Registration/Renewal/Transfer Fee annually. - Net Onboard reserves the rights to approve, decline, make changes, or cancel this promotion without prior notice. ** A charity organization is a voluntary and not profit organization set up for charitable, social, philanthropic or other purposes. It is required to use any profit or surplus only for the organization’s purposes, and it is not a part of any governing department, local authority or other statutory body. For enquiries, Submit Ticket to us. Sponsorship Sponsorship March 27, 2009 by admin. Great news to all bloggers!! A new sponsorship opportunity is now opened. 10 sponsored hosting accounts for blogger up for you grab for FREE! We are going to offer 10 lucky blogger to host their blog in our server for free. However, please note that the sponsorship does not include domain registration/renewal/transfer fee. You may fill up the blog Sponsorship form and submit to us. Next, we shall notify you on your request. The 10 lucky bloggers will have the chance to subscribe to our 10GB hosting plan FREE for the whole year. FREEbies is in the air. Why wait? Contact us now by submitting your request at www.supportchain.com. - In order to apply for the sponsorship, the applicants have to agree with following Terms & Conditions. - Your website must have minimum of 3000 unique visitors daily for the past 3 months. - Your website must have minimum of 3 page view per visitors for the past 3 months. Shhh.. There’s a news here..
Now, not only students can get sponsorship, Forum Owners could get too.. The chosen forum will be able hosted free for the whole year. The best part is, the sponsorship does not end after 1 year. You may continue getting your forum sponsored by us upon yearly evaluation.